Everything managers and executives dont knowand need to knowabout macroeconomics, but were afraid to ask. 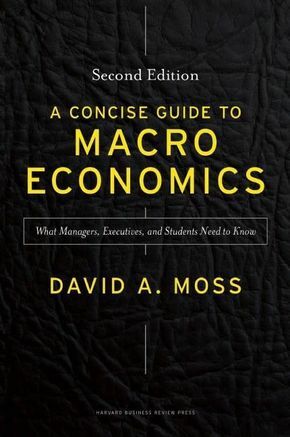 In this revised and updated edition of A Concise Guide to Macroeconomics , David A. Moss draws on his years of teaching at Harvard Business School to explain important macro concepts using clear and engaging language. This guidebook covers the essentials of macroeconomics and examines, in a simple and intuitive way, the core ideas of output, money, and expectations. Early chapters leave you with an understanding of everything from fiscal policy and central banking to business cycles and international trade. Later chapters provide a brief monetary history of the United States as well as the basics of macroeconomic accounting. You\'ll learn why countries trade, why exchange rates move, and what makes an economy grow. Moss\'s detailed examples will arm you with a clear picture of how the economy works and how key variables impact business and will equip you to anticipate and respond to major macroeconomic events, such as a sudden depreciation of the real exchange rate or a steep hike in the federal funds rate. Read this book from start to finish for a complete overview of macroeconomics, or use it as a reference when you\'re confronted with specific challenges, like the need to make sense of monetary policy or to read a balance of payments statement. Either way, you\'ll come away with a broad understanding of the subject and its key pieces, and you\'ll be empowered to make smarter business decisions. An incredibly clear and sophisticated introduction to macroeconomics." Any critical observer of current debates about the state of the macro economy needs a clear understanding of a half-dozen basic concepts, how they are measured, and how they are connected. David Moss\'s short, jargon-free book provides just that. It does not tell you what should be done, but how to begin thinking about what should be done." An extraordinary pedagogical achievement. The tight focus on the macroeconomics that are essential for understanding the business environment and the lucidityof the writing make this an ideal text for business students and executives."